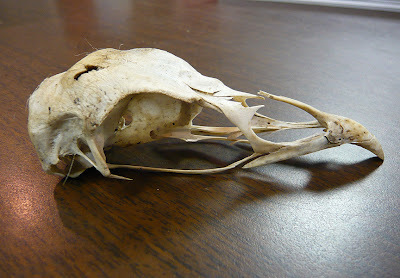 Here's one for you bird sleuths to figure out: an avian skull I found (along with the rest of the feathery skeleton) in a wooded portion of eastern Colorado. I'll post the ID answer in a bit- for now leave your guesses in the comments section. Plus assorted other non-avian wildlife. I watched part of a neat little drama in my Longmont, Colorado back yard yesterday. While I didn't see the opening act, my attention was drawn to movement on a flagstone pathway underfoot. 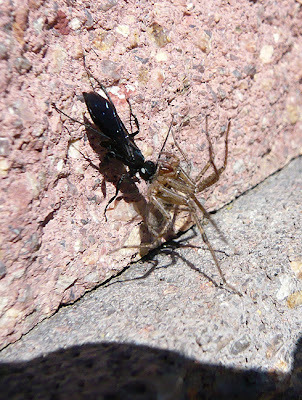 Stooping over, I saw a small black wasp dragging a spider along backwards. I spooked the wasp and it flew away, but when I backed off it returned to claim its trophy and continue to drag it along the pathway. I ran inside to get my camera, and by the time I got back outdoors it took me a while to re-find the wasp & hapless spider- the wasp was making quick progress. It was hard to snap pics because it moved so fast, and when I got in too close the wasp would drop the spider and run or fly off. Luckily, it kept coming back to its victem, and eventually it dragged it up and over a low retaining wall. 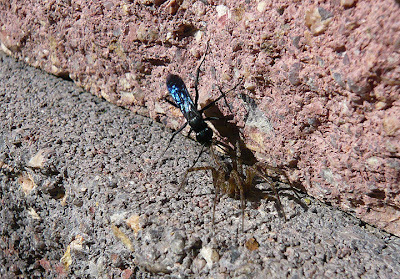 Belonging to the family Pompilidae, these spider-hunting wasps immobilize their prey with a sting, drag them to their burrow, and lay an egg in the spider. 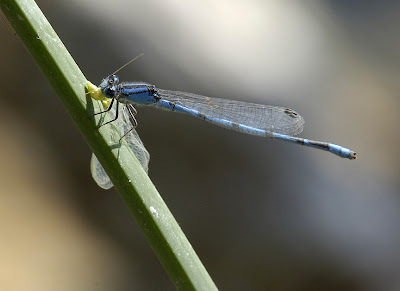 The hatched larva consumes the spider and then pupates in a protective cocoon to wait out the winter. Vicious world, isn't it? If anyone knows more about these wasps (in general, or this specific one) I'd love to hear from you. 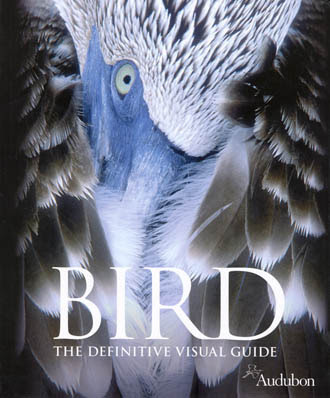 I had the pleasure of receiving a review copy of Bird: The Definitive Visual Guide last week. The massive mailer yielded a fantastic jumbo-sized tome, the result of a collaboration between Dorling Kindersley (DK) and The National Audubon Society. The cover (at 10" x 12") of a displaying Blue-footed Booby hints at the photographic treasures inside- the whole thing is full of eye-candy. 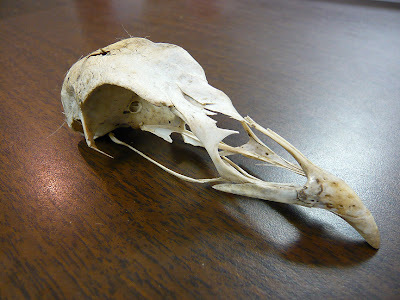 The lofty goal of the project seems to be to cover at least a bit of every aspect of birds. I'm familiar with other, smaller DK titles that aim for similar goals with topics like dinosaurs, fossils, rocks & minerals, etc. I use them as supplemental references in my classroom, and they have inspired hundreds of my earth science students. I hope that this book will similarly excite and inspire folks to pay closer attention to birds, and I'm sure it will catalyze many forays into birdwatching and even (-gasp-) birding!! With a subtitle like "The Definitive Visual Guide" you can expect this book to be chock-full of pictures, and you won't be disappointed. 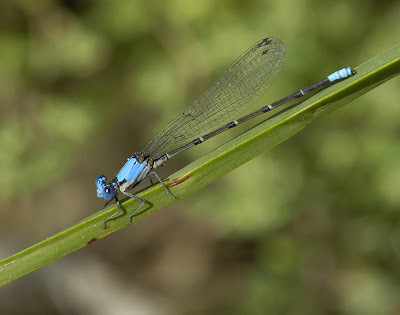 Unlike photographic field guides that choose pictures primarily for their identification merits, these pics (with over 1500 species featured, there are hordes of them) seem chosen largely for their artistic merit, fantastic habitat association, and/or stunning action & behaviors depicted. As a serious bird photographer I'm both inspired and humbled by many of the shots. Besides the various species account boxes and their accompanying photos, there are full-spread, two-page wide (10" x 20") shots to whet your appetite at the forward (several here), at the section headings, and sometimes within a section for some major visual impact. At around 500 pages, I'll be soaking the imagery up for a long time, but already I can tell you that among these one of my favorites features an underwater shot of a King Penguin with almost abstract, motion-blurred waddle-mates streaking along behind it. A photo of a Spotted Sandpiper chick camouflaged amongst leaf litter and a dropped pine cone is simply masterful. Bohemian Waxwings foraging on a winter-leafless but berry-laden mountain ash is totally killer, particularly with two of the birds in flight. 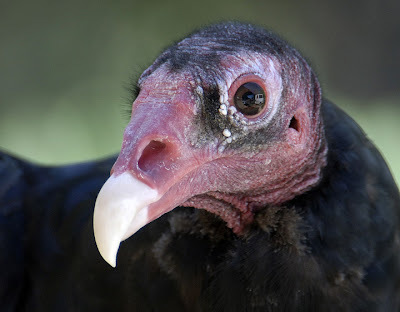 And the Lapet-faced Vulture portrait, all head and neck against a black background, is unexpectedly expressive, powerful, and colorful. With little feather bristles around its ear it looks like an old but still strong man who's about out of patience with you. You aren't really sure how he'll best you, but you're pretty convinced that you'll regret it if you cross the line with him. These favorites are just chosen from the big spread pages- every page full of species accounts has amazing images, with a great representation of flight shots. Beyond the pics, the book has a lot of information to offer. By covering a bit of everything (the intro chapter contains sections on anatomy, senses, feathers, wings, flight, gliding & soaring, legs & feet, bills, feeding on animals, feeding on plants, communication, defense, breeding, courtship, nests & eggs, parental care, living together, migration, migration routes, birds under threat, conservation, and extinct birds, for example), the team of authors limited the amount of information dedicated to any one subject, but it makes for a great initial exposure to these topics, always supplemented by A+ photos or graphics to illustrate their points. For someone really bitten by the bug that the introduction section of this book presents, I'd advise following up with the more massive & more information-dense (but less beautiful) Handbook of Bird Biology, put out by the Cornell Lab of Ornithology. After the introduction, habitats are addressed, followed by sections featuring the major groups of birds. Interspersed throughout the species accounts are famous birding locations under the heading of Great Sites, each with another large photo spread, a map, a write-up, and smaller pictures of representative birds found there. As if all of that wasn't enough, the book also includes a CD with 60 tracks featuring birds from all around the world and up & down the taxonomy list, supplied by Cornell's Macualay Library. I suppose that every book has its quirks, too. 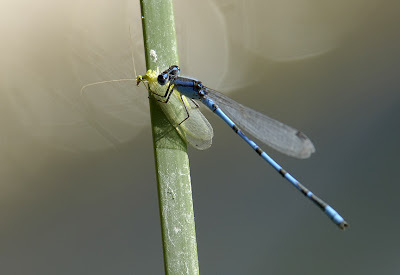 One thing I couldn't figure out was the inclusion of the occasional species account that didn't have a picture with it- strange for a visual guide. These photo-less birds do have a paragraph that somewhat describes them, along with a range map (compiled by BirdLife International), size, migration status, & habitat (as do all species accounts.) The second slightly awkward part is the difficulty I had connecting the CD to the text- I would have expected birds featured on the CD to have some sound icon in their species account boxes- a cue to play the track as you hit that bird in the book. Instead, tracks are listed at the very end of the book (literally, the very end, after the acknowledgments) with a page given to turn to to see the bird in question- almost like it was an afterthought (albeit a cool one...) And I wish the Great Sites were listed in the table of contents, or given their own section, or connected to the habitats somehow, not just sprinkled around somewhat randomly. Beyond these minor quibbles I'd say that the book is well worth the paper it is printed on. Informative, insightful, and inspirational, I think hard-core birders, casual birdspotters, and nature-lovers alike will get a lot out of it. I congratulate DK and Audubon on this magnum opus, and I'm sure it will bulge or blow out many a holiday stocking this winter, delighting many a recipient. 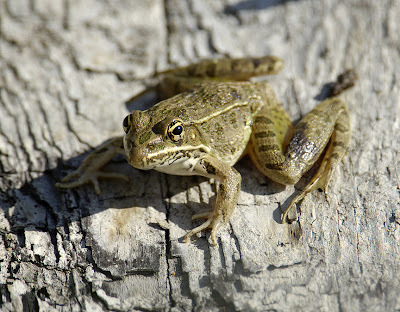 Last weekend at Bonny Lake State Park and nearby spots the birding really got slow after our mid-day CFO meeting. 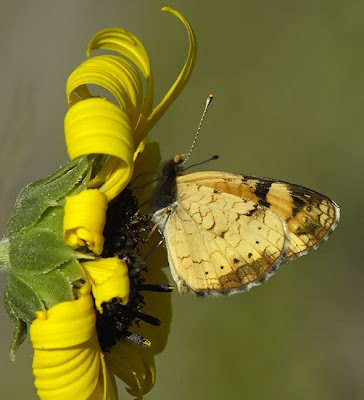 But in the summer, there are always interesting non-birds to seek like Leps, Odes, and Herps. 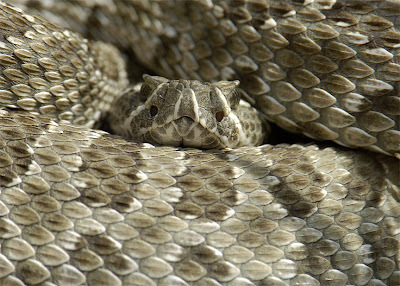 And better yet, some of my buddies actually know what they are doing with these critters, unlike me, so I learned a lot. Still, my IDs are tentative and I'd happily entertain improved ideas as to what they are. 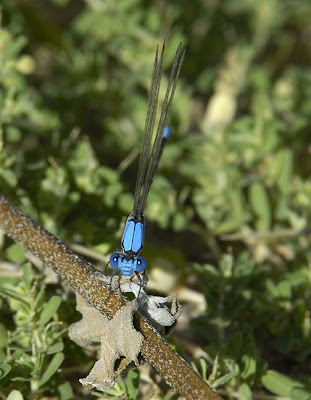 At Hale Ponds, several colorful Damselflies were on the prowl around the pools formed on the S. Fork of the Republican River. 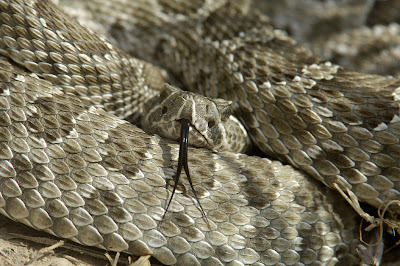 Finally, we had a pretty cooperative Western Rattlesnake. 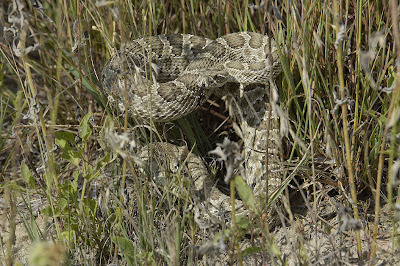 It was making a run for it through the grass, giving little shakes of its rattle as it went that Nathan recorded. When we got it to coil, though, it stopped rattling. Maybe it knew that Nathan wanted to record it and was being obstinate about the session. Oh, well, it couldn't cloak itself from my photographic recording, now could it? My artistic pal Sherrie over at Brush and Baren tipped a nice recognition my way- the Creative Blogger Award! As mentioned in a recent post, I spent last weekend on the east side of Colorado, so close to Kansas that an unladen swallow sent east could make the crossing within minutes at the most. Prior to our mid-day CFO board meeting, some pals of mine & I spent the morning birding around Bonny Lake State Park. I'd say that the birding was slow, but not uninteresting (is it ever?) One nice thing about spending time out there is getting into a different mix of birds. For example, the woods and glades around the park are reliable locales for Red-headed and Red-bellied Woodpeckers, and Eastern Bluebirds, species that are rare or absent in most of the state. We were also hoping for some warbler migration but the woods were pretty quiet on that front- in fact, at least one sub-group went warbler-less all morning. I had a little group of Willy Warblers (think yellow with a black cap on the males) but that was about it on the warbler front during the am hours. We did find a "good" migrant, though. Just a few minutes after leaving the bunkhouse we stopped to study a group of kingbirds, hoping for a Cassin's. They proved to be Western Kingbirds, but while stopped I noticed the dark-looking back of a small buteo perched in pretty thick woods- already suspicious since the locals (Red-tailed, Swainson's, & Ferrugionous Hawks) generally like more open country. The bird flew to a new perch but was still in view, now facing us, and when I scoped it I surmised that it was a youngster Broad-winged. 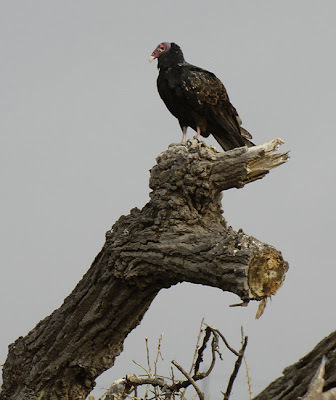 More migrants turned up in the open grounds north of the lake in the form of a venue of Turkey Vultures roosting around a cottonwood graveyard. 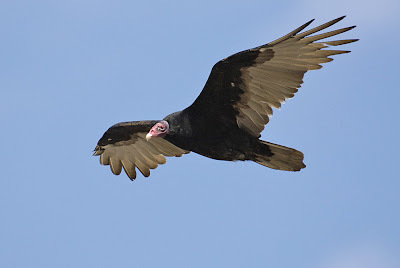 TUVUs were apparent all day, and as thermals built we saw kettles on the move both near and far. After more looking hard to see little (bird-wise), we crossed the long dam heading south to complete our revolution around the lake. By now the day was quite windy, signaling an approaching cold front. 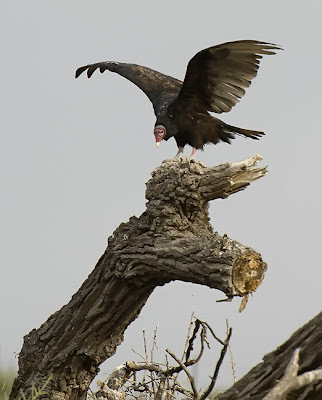 Ever oppurtunistic, Turkey Vultures were using the massive artificial structure to get a free boost, riding the upward kick created as the wind rose over the dam. I've seen this phenomenon a few times before, notably at Pueblo and John Martin Reservoirs. 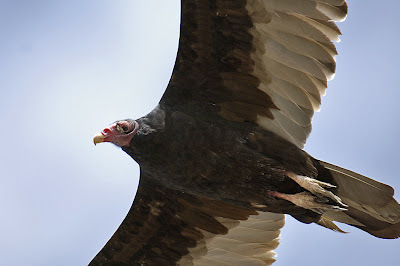 This led to some neat photo opps, as the vultures quartered along at eye level (or even below) with sunlight at my back. 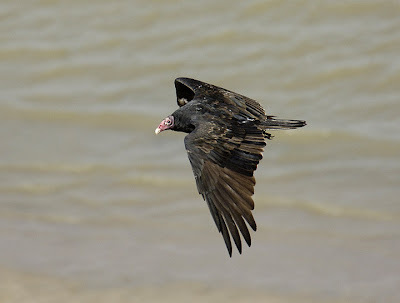 I find that Turkey Vultures are usually pretty shy critters, and many would veer off their path instead of coming by within ideal range of my telephoto. Youngsters like this bird (note the blackish head) have less good judgment, though, and would even hover right above me to see what was going on. Numbers were on my side, though, and some of the adults eventually came by nice and close. 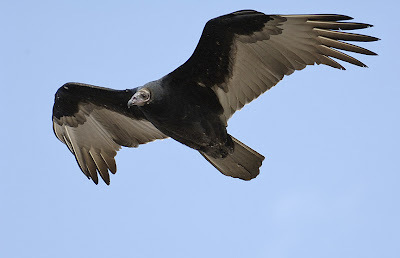 I even got a few shots of birds below me, offering a less commonly seen perspective of a flying Turkey Vulture. I'll end with this shot of an adult who let its curiosity get the better of it. This is the full, uncropped frame, and I had to pull back on my zoom to fit in what I did. Crazy bird- they usually like to keep their distance but maybe this one wondered what the juvs were noticing about the guy with the big eye on the dam. This just in- E7 takes the long-distance flight prize! Check out this BBC article about E7, a female Bar-tailed Godwit that completed a week-long, food & water-free 11,500km non-stop flight from Alaska to New Zealand. Satellite telemetry confirmed the impressive feat. Way to go, E7! I wonder how much body mass these birds burn off? Tell you what, E7- why don't you take a few days off to grab a bite to eat. p.s. 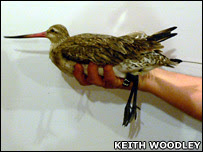 I'll extend the invitation to any Bar-tailed Godwit to make the shorter, easier flight to Colorado whenever they'd like! I had a much-needed birding and naturalizing weekend over the last few days- starting off another school year right takes a lot of time and energy and I've felt the fall migration slipping by without getting out much. To remedy this, a bunch of friends and I met out in eastern Colorado (almost spitting distance from Kansas) at Bonny Lake State Park. A bit of the trip was for birding business, as we had our Colorado Field Ornithologists board meeting at the Colorado Division of Wildlife work center mid-day on Saturday. We arranged the use of their bunkhouse (thanks, DOW! ), enabling us to get there Friday night, bird Saturday AM & PM, and stay after the meeting to see what we could see on Sunday before heading home. Anyway, I was carpooling out after school on Friday with fellow Boulder County resident and bird sound recordist extraordinaire Nathan Pieplow (check out his article on describing bird vocalizations in the latest Birding Magazine.) 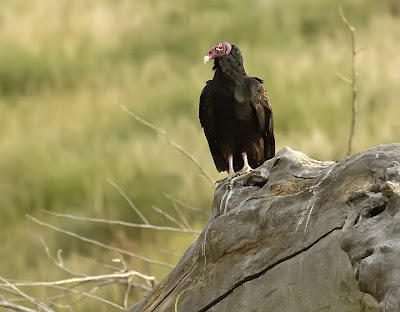 We hit a little vagrant trap called Last Chance on the way as the sun was setting, picking up a few neat birds and even more mosquito bites from some tiny variety that could soundlessly approach, land, and extract blood seemingly without detection. From there it was off to Bonny, driving in darkness with eyes peeled for roadside owls. As we made the turn onto the dirt road for the final approach to the bunkhouse, we paused at a few groves that always hold Eastern Screech Owls. Nathan perfectly whistles both EASO songs (the whinney and the tremelo), and soon had rivals singing back. 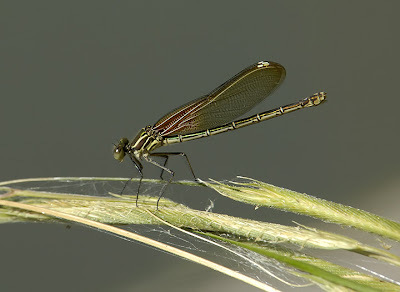 I had my camera at the ready, including my big external speed flash mounted up. Nathan had his fuzzy stick (Ted Floyd's term for his long wind-baffled shotgun mike) and digital recorder at the ready as well. Unfortunately, the owls were content to serenade us from unseen perches so I got nothing and Nathan got so-so recordings, but how bad can it be to stand out on a moonless, star-lit remote dirt road surrounded by singing screech owls? Anyway, we were off to try another spot, so I kept my camera at the ready alongside me on my truck's bench seat. I always carry it around like this when the passenger seat is occupied, and it sits securely (I thought), resting on the lens hood pointing downward. In the event of a deceleration I keep it in place with my right elbow- it is kind of mashed in against my side, anyway. In this position, the mounted flash was pointing straight out at the dashboard. Yeah. Well, despite this foreshadowing, having the camera at the ready with flash and everything turned out to be cool, because a little ways down the sandy road I noticed a Kangaroo Rat along the edge as we went by. I turned around, and sure enough the little guy was still there. I coasted to a gentle stop & killed the motor, leaving the truck lights on. 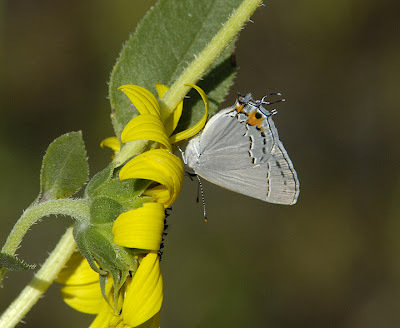 Much to my surprise, it didn't immediately depart into the sunflowers and weedy veg along the road but instead continued to forage, probably not seeing much in my direction but glaring lights. 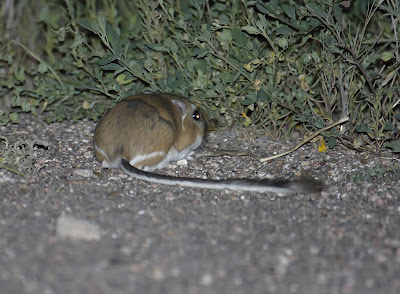 I was able to snap some shots of Colorado's only Kangaroo Rat, the Ord's Kangaroo Rat. Nice trade for missing any owl photo opps. Anyway, here are a few pics that I'll dedicate to my favorite nocturnal mammal photographer, the Camera Trap Codger. The tail is foreshortened in the first pic, but it was the best body shot I got. The second pic gives you a better idea of how long the tail is. 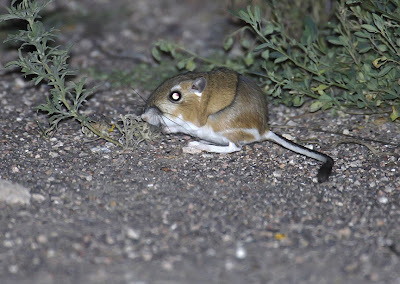 Still, Ord's Kangaroo Rat has a relatively shorter tail than most other K-Rats, according to Kenn Kauffman's mammal guide. 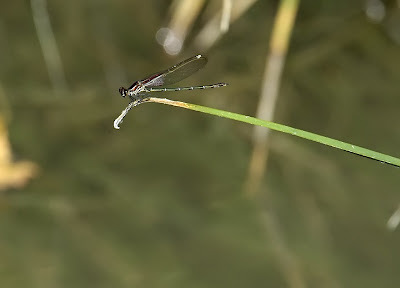 I particularly like the black stripe arching over its back and the little white stripe on its haunch. A few weekends ago I went to the Rocky Mountain Bird Observatory's member picnic at Barr Lake State Park northeast of Denver. I gave a talk on digital bird photography to a small but intent group. It was good to see many friends there, tuck into some good bar-b-que, and see a few birds. RMBO lined up some exhibitors including the Rocky Mountain Raptor Program, which brought along a couple of education birds. 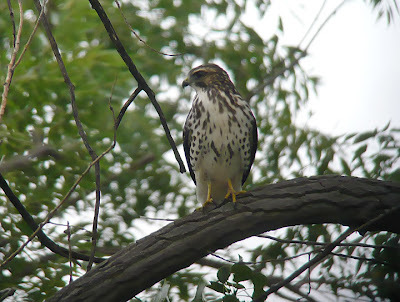 I immediately keyed in on the Northern Goshawk perching on a volunteer's arm. 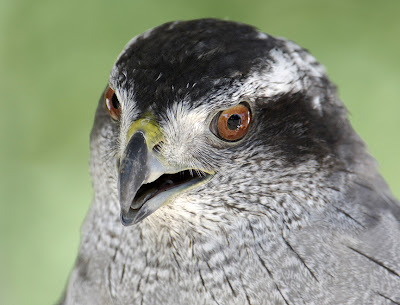 Not only is this one awesome raptor, but the species is one of my top nemesis birds. You see, I've observed them, including a couple of memorable close encounters, but I still haven't photographed a wild one. In a classic D'oh! moment a few springs ago, I had spent all day counting birds on the Dinosaur Ridge Hawkwatch west of Denver with my camera at the ready. The trail is kind of steep and rocky, so I packed up my camera for the walk back down to the car at the end of the day. 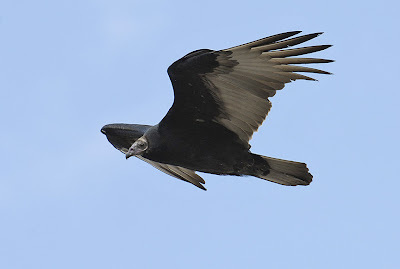 Sure enough, as I came to a switchback at the edge of the sharp ridge, a Gos wheeled up from the other side right in front of me, into the wind, with the afternoon light illuminating every feather. Yeah, my camera was nice and secure in my backpack... Oh, well! Since then I still haven't seen one close enough to snap away. 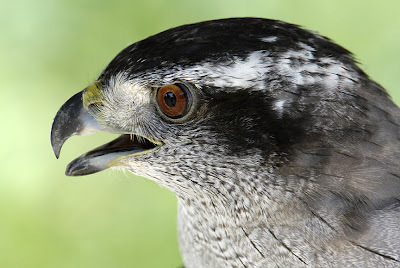 I think one problem is that even when I have one that would be OK for at least a study shot, I'm too busy staring at it to make sure it isn't a Cooper's, and by the time I realize I should snap some frames the thing is gone- in my experience, Goshawks don't linger much. Except when I'm not there. Seems like every other birding buddy of mine has had one perching calmly within at least digiscoping range, or even in their back yards! But not me. Yet... Some October soon I've got to camp out at Duluth's Hawk Ridge 'till I get my pic. Crazy thing is that I've seen one there, too, but too far away for shutter work and it was a slow day so we didn't stick around for long. 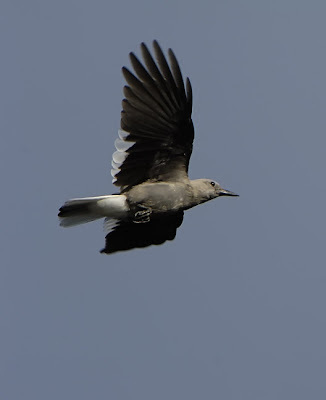 Instead, a few buddies and I chased a Fork-tailed Flycatcher in Thunder Bay, Ontario. Got it- cha-ching!- and for now, a fair trade for my missing wild Gos pics. 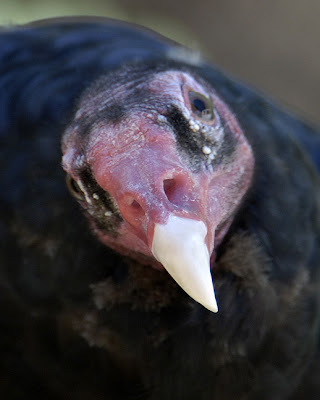 Anyway, the Rocky Mountain Raptor Program folks also brought along a very inquisitive Turkey Vulture. I had trouble getting a profile shot because it kept looking at me, or maybe its reflection in my camera lens. While not a nemesis bird in any sense for me, it was so cool to see the facial details. Kind of funny that in the second picture you can see the van that the birds came in reflected in its eye! 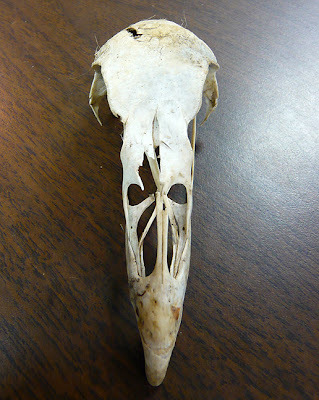 And the mostly bare head lets you see the ear canal, obscured by auricular feathers in most birds.